Shepsted is a small town a few miles north-west of Loughorough and I knew it was going to be a good day when I opened the curtains to see most of the rain clouds had vanished. I took route 6 all the way to the north of Northampton via Loughborough, Leicester and Market Harborough. Loughborough, as I had expected from its sporting reputation, was well stocked with cycling provision. The best aspect being the attention to detail in the routing of the paths especially at junctions; there are certainly other places that I'd passed through that could learn a lot here. There were also neat design features to make sure cyclists can join traffic flow without being run down. I'm not sure that I have ever been anywhere in Leicester other than stopping in a train at the main station. I realise my transit through the city was fairly superficial but I am getting the impression that from the cycle route of old canal tow paths and railway lines I do see a side of these cities that it is not seen by people in their cars or simply shopping. Route 6 leaves Leicester to the west along the old Great Central Railway line, there is an alternative route 63 that is three miles shorter from Leicester to Market Harborough which goes due south. However, it has 11 miles less traffic free routing and the climbs are steeper or so I am led to believe! 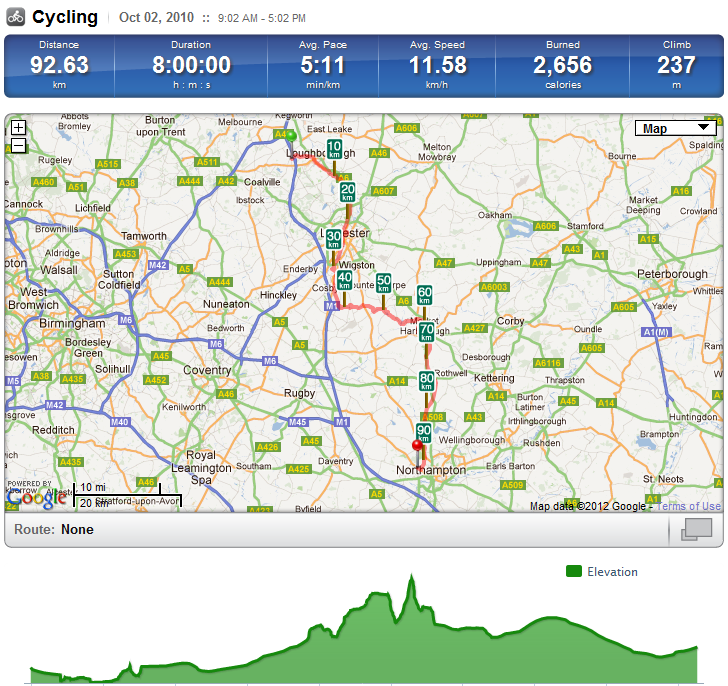 The ride I took was great and there was still some hard climbing from Leicester to Saddington, five miles north of Market Harborough. looking towards one of the steepest climbs since the Yorkshire Moors. The section along the Grand Union Canal just before Market Harborough was very tranquil; I particularly liked the various bridges that peppered the route, each one with a name which I can only presume related to the land owners for whom the bridge was constructed to provide access. One for Jane - just to make sure she knows I hadn't forgotten Frankie! Market Harborough market place where I had a late lunch of ham and cheese pancake followed by a lemon and sugar one. They were huge! From Market Harborough to Northampton route 6 is traffic-free for 16 of the 18 miles and follows what is known as the Brampton Valley Way. This consists mostly of railway lines, including over 800m of unlit section in tunnels but also some canal tow path closer to Northampton. Kelmarsh Tunnel (480 meters). I got out both front lights this time and it was much easier going! 13 miles to go and stopping to call Jane from the side of the route whilst it was still light!